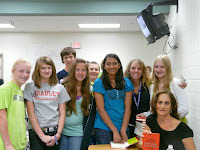 I had a blast visiting today with students at Crone and Gregory Middle Schools in Naperville, Ill. I loved all the thoughtful questions, including: "So, do you think one day in the future in an advanced civilization, doctors will no longer do transplants, but will use stem cells to regenerate nerves and create viable organs?" Um, er, maybe? 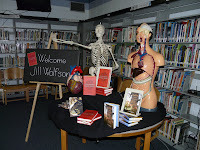 I so love the passion and energy that school librarians put into welcoming visiting authors. Check out these two fabulous book displays that greeted me as I walked in the door. Thanks Karen and Nancy. Just got to Chicago for 3 days of book promotion, school visits and speaking at Anderson's YA conference in Naperville on Saturday. Looking forward to being on panels and hearing Judy Blundell, Gennifer Choldenko, among others. Come if you're in the Chicago area. Here's the link with the details. About a month ago, I was helping my mom clean out my childhood home and came upon my middle-school diaries. Wow, what a drama queen I was. Hmmm. Drama Queen 7th Grader=Children's Book Writer. I invited other writers to share their earliest and most personal writing. The invitation stands! Let me know if you want to participate. I've written in journals since I was thirteen. You'd think that at some point I would have gone back and reread through these tomes, but beyond a few times that I’ve flipped through some of the later ones to reminisce about an event, nope, I haven't cracked any of them open. I realize now, that I should have, if only for the entertainment value. Wow, I was silly at thirteen. For example, my sister got married that year so this event got a lot of page time in my journal. 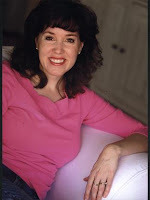 I understand my writing about my worries--they were mostly because my parents thought she was too young to get married. (She was the oldest so I hadn't realized at that point that my parents thought 32 was the respectable age to marry. )—but I described every detail of the day including the wedding luncheon and the reception. I wrote about the red punch, (it was so good I breathed it in) how many forks were used, (three, and they were silver) how many pictures were taken of the bride and groom (at least 250) and I even drew diagrams of where we stood in the reception line, what the cake looked like, and the poles that marked off the dancing area. I have no idea why I felt the need to record all these details. Did I think someday we were going to reenact the event? Was I writing it down to make sure my reception was just as fancy? Did I think archeologists would one day unearth my journal and need it to understand wedding rituals of the 20th century? I have no idea. It was the only bit of information I didn't write down. I wouldn't mind being married. Sometimes I just want to get away from it all, from my parents, from all the things I do around here that I wish I didn’t have to do. Then I went on to talk about my cousin, Jill’s wedding reception—luckily without the details about every food on the table or what color the napkins were. 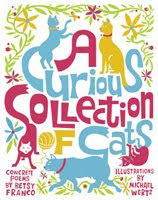 My interview with Betsy Franco, the wonderful children's book author, was just published in Stanford Magazine. Betsy has 6! new books scheduled to be published this year, including her first YA novel. The artwork is by one of her sons -- and yep, another son is heartthrob James Franco. Here's the link to the article.